The TT600 TB's indeed lack injector ports. The fuel rail is attached to the TB assembly but on the Triumph they go into ports on the cylinder head. I'm not yet sure but I think I'll fab some additional runners after the TB's and place the injector ports in there. 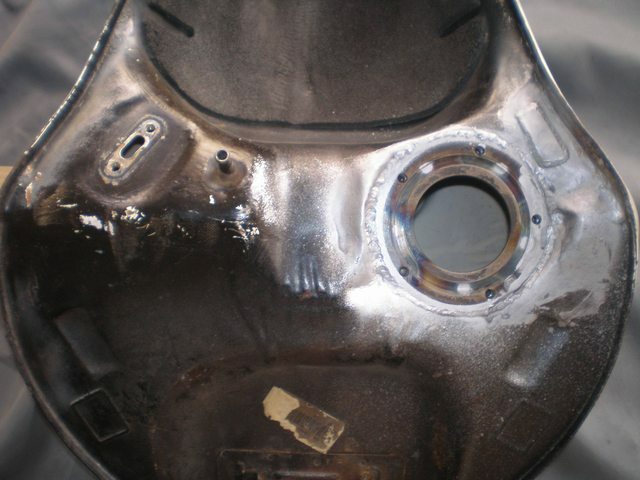 Maybe weld a vacuum tank on there too. The TT600 TB's outlet ports are a bit wider than the CB-1 Carb outlets so I need to do this anyways. A small taper from TB to cylinder head is always good. Speeds up the intake. Additional intake runners sound like a good plan if you have room to spare... I don't know about the CB-1 but the B4 does not have any free space at all to consider such a fabrication. And since no other set of TBs fits in I had to do my best with the existing carb bodies. It does have a few good things though like you don't have to figure out new ways to mount them or respace them or change intake boots or reroute throttle cable. If you have the means to fabricate some injector pockets on the existing carb bodies I would recommend that you give it a thought. Looks like a good time for an update! However before I went on in spending extra cash for replacement fuel pump and fuel tank modification I wanted to make sure that the bike is running properly on its microsquirt brain. So I used the bike long enough and in almost any driving condition to make sure it does work and it does worth the money. And so it did, and in addition to that, during this "testing" period another deficiency of my simple fuel system appeared and made this kind of replacement more like a necessity rather than a "luxury" upgrade option. What I noticed was that the engine was stalling, when reservoir was low on fuel and especially when leaning for a left turn. I think that fuel flow to the pump (which was gravity fed from the tank) was simply not adequate under certain conditions and this would lead to engine fuel starvation. 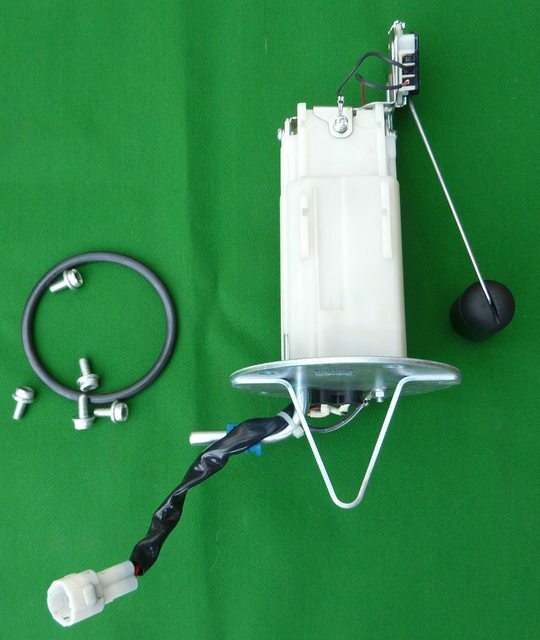 So I started searching for a suitable fuel pump. 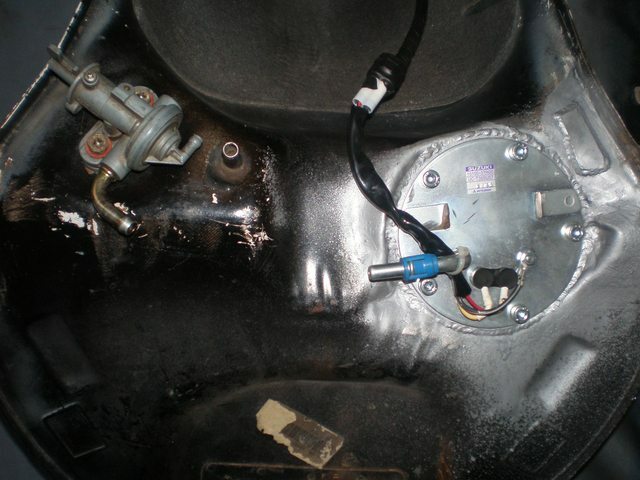 After some research I concluded that the fuel pump from GSXR600 - 750 K8 and on would be the best possible fit. Low power consumption, integrated pressure regulator for a returnless fuel system (and at the same fuel pressure I was running before so no need to change anything in VE table), "sumpless" design for the pump housing cause there is no space available for anything extruding underneath the tank. An attractive item popped up at ebay and went for it. A few days later I had the desired fuel pump in my hands. I would like to have it placed more close to the center of the tank but as I said, options were limited. I am quite pleased with the outcome!